We have worked with many people leaders through our Discovery in Action® program – almost 600 people – over the last 10 years. In recent times we’ve become increasingly curious about those factors that seem to hinder consistently good leadership practice, or taking a more positive outlook, the key strengths that underpin great leadership practice. As we’ve reflected on this, while continuing to listen, observe and engage with many leaders a number of key themes are emerging. We thought it might be helpful to share this emerging list with others, both as a useful frame of reference as well as to continue to test our thinking. Outlined below is the list of key factors that all need to be present (to a relatively high degree) if an individual is going to excel at people leadership. The opportunity exists to ask yourself: Where am I at personally in relation to these factors? Which ones need attention? Purposeful Effort – They apply deliberate, purposeful and conscious effort to their leadership practice – I am continuously and consciously implementing leadership behaviours and actions and reflecting on my effectiveness as a people leader. We have observed the best leaders to be continually working on their leadership practice – they see leadership activities as a critical part of their role for which they take a planned and transparent approach. Leadership Accountability – They fully accept and take-up their leadership responsibility – I fully accept that I am responsible for optimising the performance of my team. Poorer leaders may attribute a significant proportion of team performance (or more likely under-performance) to either external factors or the quality of the team members themselves. Effective leaders accept that it is their responsibility (fully) for creating an environment for people to perform at their best. Understand Personal Drivers – They have a good understanding of the underlying drivers of their leadership behaviours – I understand why I am proficient at some leadership behaviours and struggle with others. Effective leaders are able to be truly honest with themselves, through personal reflection, to identify the very human desires, fears or beliefs that may unconsciously drive their habitual actions or non-actions. This heightens their awareness, allows them to challenge these underlying drivers and work on developing new positive leadership habits. Self Awareness – They have high levels of self-awareness as to their strengths, weaknesses and the impact on the people they lead – I know my strengths and weaknesses and understand the impact this has on my staff. Good leaders continue to actively seek feedback – through ongoing conversations with staff and colleagues, 360-degree or upwards feedback processes, attentive observation and reflection – to understand how their day-to-day actions and behaviours are experienced by others and the impact, positive or negative, that has on people in terms of morale, well-being, motivation and performance. Skills & Know-how – They have the skills and know-how with regard to good leadership practice – I feel confident that I know what good leadership practice looks like and that I have the skills to implement. It would be very difficult to be an effective leader without having a kit-bag of skills and knowledge in the practical and basic aspects of people leadership e.g. active listening, leading teams, goal-setting, coaching, providing and receiving feedback, leading change etc. Effective leaders need to be proficient in a range of leadership skills. Of course, these can always be developed and enhanced through training, reading, coaching, mentoring, practice and reflection. Leadership theory – The have an understanding of leadership concepts and models – I have a good understanding of leadership principles and concepts. At a deeper level, the more effective people leaders have a good understanding of the basis for their leadership actions and behaviours – a good sense of ‘why’ certain actions are appropriate based on research into human behaviour. This can be in the fields of motivation theory, models of change, situational leadership, emotional intelligence etc. This enables them to both work out what needs to be done in situations and to make sense of their experiences. If you are relatively strong in all these factors, then it is highly likely you will be a highly respected and effective leader of people. 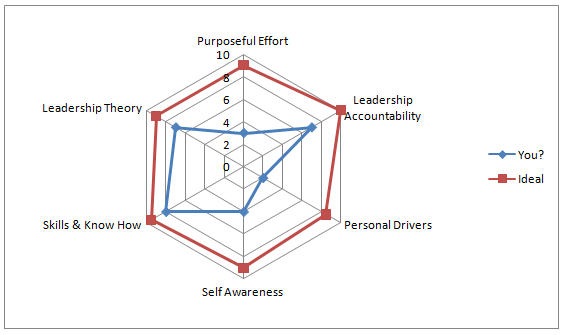 You may want to quickly reflect on your own strengths on a spider-web graph (example below) to just to get a sense of where you are at and what you may want to work on. However, another one of our observations may be pertinent to take into account. In many cases, we observe that the real key to improvement is not usually to be found in developing more skills, knowledge and understanding of leadership theory. We tend to observe that many leaders have a sound grounding in these and whilst these can always be further improved and developed the most significant gains are to be found through awareness, self-reflection, accountability and purposeful effort i.e. it’s less about more knowledge and more about more deliberate practice! Where might you sharpen the saw of your leadership practice?